Today I received an email from my cousin in which he announced to various members of the family that he was shutting down his father's Internet and email account. His father, my uncle, is 94 years old and has been suffering from problems with his vision for some time now. The last time I saw him, I asked him specifically what was wrong with his vision and what he described to me was macular degeneration although he didn't use that term and wasn't sure what the term macular degeneration was. My cousin had told me that his father's vision had been deteriorating to the point where he could no longer read anything never mind a computer screen. If he had anything to do with reading, it was through talking books. Today's message told me that the fight was over; it was time to pack it in. Scientific journals will do a better job than I so I will restrict myself to the basics in layman's terms. 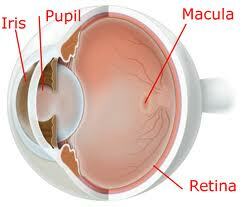 The macula is a yellow spot in the centre of the retina. While the retina is larger and includes your entire field of vision, the macula is centralised and specialised for high acuity vision. A degenerative process progressively damages the macula to the point where it no longer functions. The person still has peripheral vision but is blind in the centre of their field of vision. 2 years ago now, my optometrist was perplexed during an eye exam and wanted to give me a second going over. He told me of seeing a discoloration on my retina and started asking me questions about my vision. I couldn't tell him that I had experienced any problems but he recommended that I immediately start taking vitamins with added lutein. Up to this moment, I didn't know what he was thinking of but he then went on to assure me he didn't think I had macular degeneration. Thanks for calming my nerves but I don't even know what the heck that is! He fills in the details and to my question about what this eventually would lead to, he tells me to hold up both of my fists in front of my eyes. "That's what you would see if you have macular degeneration." What? Yes, he explains, the central part of the field of vision stops functioning and you can only see what's on the sides, the periphery. I must admit that I did not appreciate the magnitude of this condition when first told about it. I have sight; I have always had sight. What would I do if I no longer had sight? Is this condition even more frustrating than total blindness in that you are constantly teased "peripherally" with what you can no longer see? My optometrist also discussed sunlight with me. Guess what? I have avoided wearing sunglasses just about my entire adult life and I was at this point 56. He explained I must faithfully wear sunglasses at all times when out in the sun. Is it never too late to start? Have I already damaged my eyes? According to the experts, lutein and zeaxanthin are "carotenoids", an organic yellow pigment which is used by our eyes to absorb damaging blue and near-ultraviolet light; it acts as a natural sunblock analogous to sunglasses. Apparently, zeaxanthin is predominates in the macula while lutein predominates elsewhere in the retina. Supplementing my diet with multiple vitamins with added lutein and zeaxanthin follows the buzz in the medical community that this helps the eyes and possibly staves off macular degeneration. True? False? I think back to the moment where I held my fists up in front of my eyes. I'm not sure I want to wind up like that. I think of my uncle whose computer is gone and now must rely on talking books as he can no longer see well enough to read. Man, life without sight? I shudder to think about that one. I doubt I could live alone under those circumstances. For anybody who has read my ramblings about health, you know my general policy is to be pro-active when it comes to dealing with the old bod. I'm not a hypochondriac but I've realised that sticking my head in the sand doesn't mean I'm going to avoid what ails me or what may eventually ail me. I always have an annual physical. I always discuss with my doctor any issues I may have run across to get his expert medical opinion. I make sure that I regularly have certain tests like my PSA (see my blog My Prostate: something near and dear to me) and although less frequently, I don't forget about my backside (see my blog Where the sun don't shine: my colonoscopy). I know that sooner or later I am going to die (see my blog 58 down, 23 to go) but I would hope that between now and then I can maintain a certain quality of life which means being healthy, being mobile and being lucid. I want to remain independent! Run for your lives! Literally. should be the rallying cry for all of us. The following web sites have posted pictures which attempt to illustrate what one would see if suffering from this condition.